Issue #158: Ben and Alicia go to the opera (! ), Johnny tries and fails to pick up women, Reed and Sue discuss Sue starting her own detective agency (!! ), and Medusa is still with the team. Later that night, Quicksilver shows up in New York. He sneaks into the Baxter Building and picks a fight with Johnny. After a few pages, the rest of the FF show up and break up the fight. Quicksilver says he’s there to take Medusa back home. Medusa is needed because Attilan, the Inhumans’ hidden city, has been attacked by invaders from the fifth dimension. They’re led by a guy named Xemu. He says his goal is “conquest,” and he has a sound-based weapon called the “Thunder Horn.” It’s not a “laser” but a “saser.” (I’m not joking.) 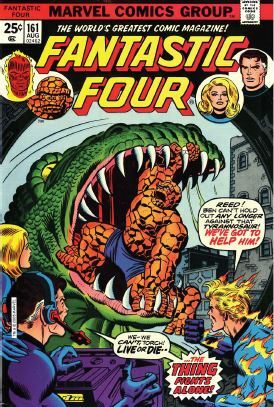 The issue ends with the FF taking off in their private rocket, to go to Attilan and join the battle. Issue #159: The FF arrive in Attilan, finding it deserted at first, only to be then attacked and taken captive by Xemu’s goons. 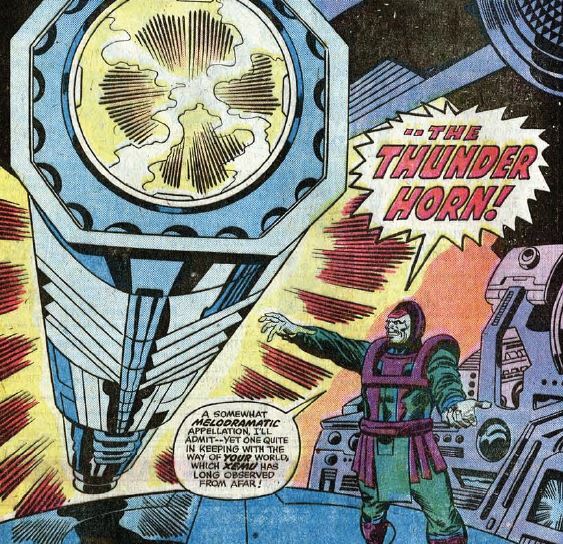 Xemu plans to use Black Bolt’s super-powerful voice to power the Thunder Horn. The Inhuman Triton frees the FF from their cell, but no one can think of a way to defeat the Thunder Horn. The Chinese government launches jets armed with nukes, flying towards Attilan. Xemu sees this and flees back to the fifth dimension. 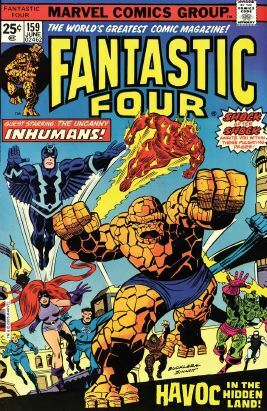 The FF and the Inhumans fight Xemu’s henchmen, and Ben destroys the Thunder Horn. In the Fifth Dimension, Xemu doesn’t get away, but he is confronted by Johnny and Quicksilver, and two other fifth dimesnioners, named Valeria and Phineas. Xemu is captured, and Johnny shares a romantic kiss with Valeria. Johnny then announces he’s going back to his original blue uniform. Medusa says she’s going to stay behind with the Inhumans, and the original Fantastic Four are a team once again. 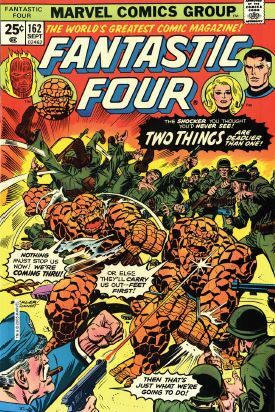 Issue #160: It’s Valentine’s Day, so of course the story begins with the Thing fighting a pterodactyl-flying barbarian with lightning powers. This guy is Arkon the Annihilator, formerly known as Arkon the Magnificent, who previously fought the Avengers a couple of times. Alicia happens to be nearby, and is there when Arkon defeats Ben and teleports him away. Alicia rushes to the Baxter Building, only to find Ben is there, with his teammates. Reed promises to contact the Avengers to coordinate an investigation. Alicia gives Ben a piece of the other Ben’s torn shirt, and he starts his own investigation. He contacts the Inhumans, who send the giant teleporting dog Lockjaw to him. Lockjaw does the “bloodhound” thing, taking a sniff of the shirt, and tracking the scent by teleporting himself and Ben somewhere else. Issue #161: Reed has his own Danger Room! No, really. A caption even informs us that it was designed for him by Professor Xavier. He’s in there testing his powers, worried that he’s losing his stretching powers. 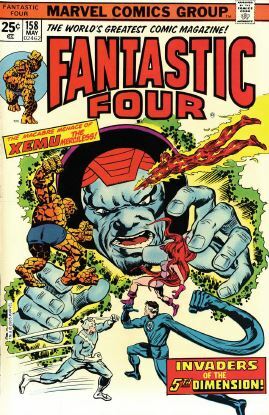 Johnny, ticked off about Reed selling the ownership of the FF, flies to a swamp in “the wilds of Long Island.” There, he stands in just the right spot that takes him to the fifth dimension. He’s hoping for more romance in Valeria, but the fifth dimensioners attack him, thinking he’s an “androne.” He finally meets up with Valeria, who informs him that the fifth dimension is under attack by these andrones (killer robots, basically) who are constructed by Alt-Reed-Thing’s company. 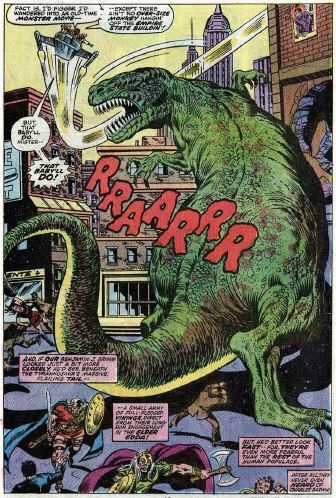 At Alt-Reed-Thing’s universe, Alt-New York is attacked by dinosaurs (why?) and, after saving the city from them, Ben is taken out by knockout gas. On Earth, Reed gets word of natural disasters and a possible second ice age, and he deduces this is because the fifth dimension is going to attack. They do, and Johnny is fighting alongside them, apparently believing that he’s attacking Alt-Reed-Thing’s dimension. 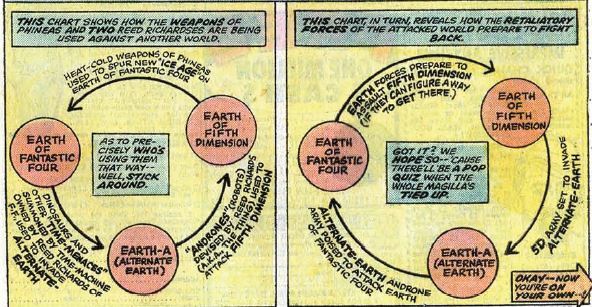 We shouldn’t have to read a freakin’ chart to enjoy our comic books! After a lot of running around and fighting, Reed figures out that DeVoor is from the alternate dimension, and is up to no good. The two Things meet and fight Johnny, eventually discovering that they’ve been tricked into fighting each other. To stop Arkon, Johnny and the two Things have to destroy the “nexus” at the center of all three realities. Get this: they travel there on interdimensional roller skates (!) that Reed just happened to have around. 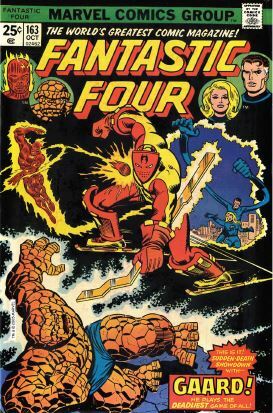 They “skate” to Arkon’s world, where they’re confronted by Gaard, who is… I can’t believe it… an outer-space hockey goalie. 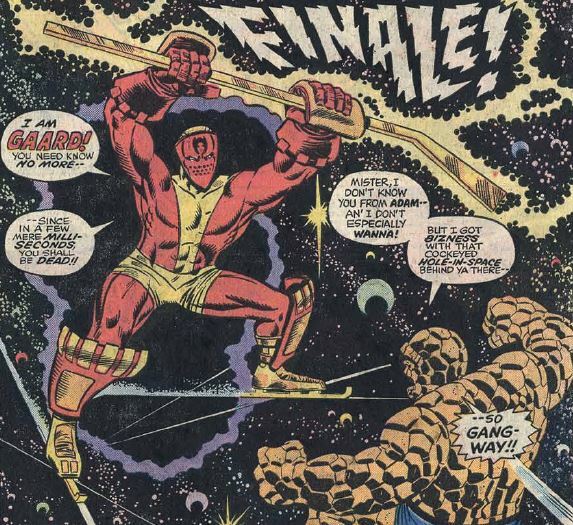 Issue #163: Ben fights Gaard in space (Gaard’s weapon is not a hockey stick, but a “cosmic scepter”) while Johnny and Alt-Reed-Thing get to know each other while duking it out with Arkon. The two Things then work together to outsmart Gaard, and they destroy the nexus. 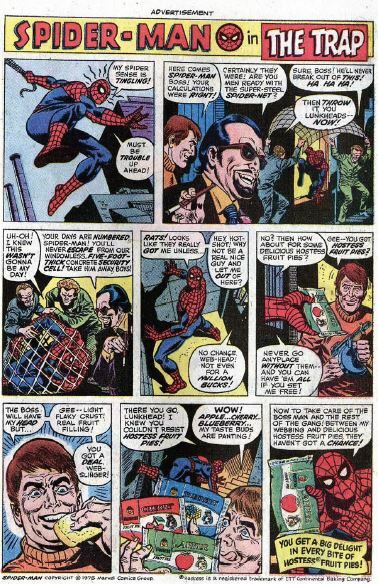 After they leave, Gaard removes his mask and… he’s really the alternate reality version of Johnny! Our heroes reunite back on Earth for the happy ending. 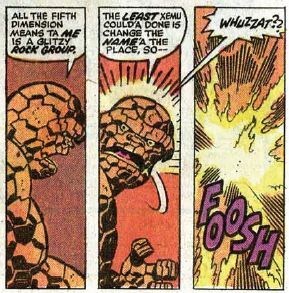 Unstable molecule: We’re not told why, exactly, Reed decides to sell Fantastic Four Inc., but by the story’s end, it’s back under his control again. Fade out: Sue pushes her powers to the limit by turning the entire city of Attilan invisible so the Chinese jets don’t lean of its location. Sue’s desire to become a private detective is pretty much never brought up again, which is a shame. That could’ve been made for some fun comics. 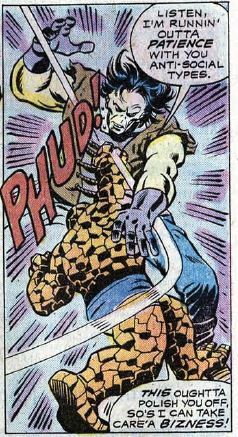 Clobberin’ time: It’s actually a lot of fun to see Earth’s rough n’ tumble Ben fight alongside the uppity, brainy alt-Ben, even if just for a few pages. Despite past ups and downs, Ben and Alicia are definitely a couple again. Flame on: We’re told that alt-Johnny died in alt-Vietnam. (The planet that has castles full of Universal monster ripoffs also had the Vietnam conflict?). What we’re not given is the full story of how alt-Johnny transformed into Gaard, except that he certainly went to hell and back. Four and a half: Franklin only appears once in these issues, with a comment about how he’s grown quite a lot since we last saw him. Fantastic fifth wheel: During the “this is what our heroes do on their day off” scenes, Medusa is shown hanging out at the library. Studying up on human culture, perhaps? Commercial break: This is comics history, people — Marvel’s first-ever Hostess ad!!! 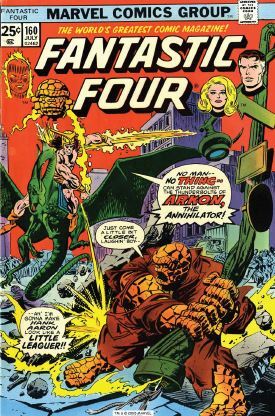 Trivia time: Not only did Arkon previously appear several times in The Avengers, but Xemu and the fifth dimension first appeared in one of the old Human Torch solo stories from Strange Tales back in the ‘60s. Fantastic Four writers sure love the name “Valeria.” The Valeria from the fifth dimension, however, is not related to Dr. Doom’s Valeria, who provided the name for… we’ll get to that eventually. Next week: It was great when it all began. I was a regular Frankie fan.